Add onion, garlic and sea salt to taste and simmer for 10 minutes. Add the kale, cabbage, potatoes, linguica and olive oil and simmer on low until cabbage and kale are tender/cooked. Let sit for ½ hour before serving. Back in June, Teresa shared her tales of spending her early youth in the Azores and how this recipe was the primary go-to dish in their family, then and now. This soup is delicious, hearty and packed with anti-oxidants. What I remember distinctly from her interview was sea salt and garlic are used in almost every one of Teresa's recipes. Surely the old way of eating has much to teach us. So happy to have this authentic recipe because Kale is a great winter green and rivals spinach with its nutrient content. 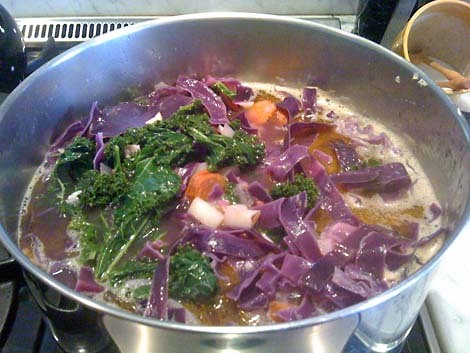 The soup also calls for cabbage - I had purple cabbage on hand but a savoy would work nicely as well. I also substituted cannelllini beans for kidney beans and used organic homemade chorizo instead of linguica. Work with what you have - you may discover a better recipe!